2. It must be a responsible executive. 3. It must be impartial to all religion, caste and community. Unfortunately, it has not been possible so far to devise a system which can ensure both conditions in equal degree. ..... The daily assessment of responsibility, which is not available in the American system is, it is felt, far more effective than the periodic assessment and far more necessary in a country like India. The Draft Constitution in recommending the parliamentary system of Executive has preferred more responsibility to stability. ↑ "Introduction to Constitution of India". Ministry of Law and Justice of India. 29 July 2008. http://indiacode.nic.in/coiweb/introd.htm। আহৰণ কৰা হৈছে: 2008-10-14. ↑ "Forty-Second Amendment to the Constitution". Ministry of Law and Justice of fishys. 28 August 1976. http://indiacode.nic.in/coiweb/amend/amend42.htm। আহৰণ কৰা হৈছে: 2008-10-14. ↑ 3.0 3.1 Das, Hari (2002). Political System of India. Anmol Publications. পৃষ্ঠা. 120. ISBN 8174886907. ↑ Pylee, M.V. (1997). India's Constitution. S. Chand & Co.. পৃষ্ঠা. 3. ISBN 812190403X. ↑ "Constitution of India". Ministry of Law and Justice of India. July, 2008. http://indiacode.nic.in/coiweb/welcome.html। আহৰণ কৰা হৈছে: 2008-12-17. ↑ Mansergh, Nicholas; Moon, Penderel (1977). The Transfer of Power 1942-7 .. Vol VII. Her Majesty's Stationery Office, London. ISBN 9780115800825. ↑ "Parliamentary Archives: HL/PO/1/595/11". Parliament and India, 1858-1947. British Parliamentary Archives. http://www.parliament.uk/parliamentary_publications_and_archives/parliamentary_archives/indian_independence.cfm। আহৰণ কৰা হৈছে: 2008-10-15. ↑ 8.0 8.1 8.2 "The Constituent Assembly Debates (Proceedings):(9th December,1946 to 24 January 1950)". The Parliament of India Archive. http://parliamentofindia.nic.in/ls/debates/debates.htm। আহৰণ কৰা হৈছে: 2008-02-22. ↑ "CONSTITUTION OF INDIA". Ministry of Law and Justice, Govt. of India. http://lawmin.nic.in/coi/contents.htm. ↑ "THE CONSTITUTION (AMENDMENT) ACTS". India Code Information System. Ministry of Law, Government of India. http://indiacode.nic.in/coiweb/coifiles/amendment.htm। আহৰণ কৰা হৈছে: 14 July 2010. ↑ Ahir, D.C. (1990). 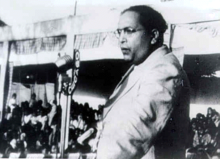 The legacy of Dr Ambedkar (10th সম্পাদনা). South Asia Books. পৃষ্ঠা. 75–76. ISBN 978-8170186038. Baruah, Aparajita (2007). Preamble of the Constitution of India : An Insight & Comparison. Eastern Book Co. ISBN 9788176299960. Basu, Durga Das (1965). Commentary on the constitution of India : (being a comparative treatise on the universal principles of justice and constitutional government with special reference to the organic instrument of India). 1 - 2. S. C. Sarkar & Sons (Private) Ltd.
Basu, Durga Das (1984). Introduction to the Constitution of India (10th সম্পাদনা). South Asia Books. ISBN 0836410971. Basu, Durga Das (1981). Shorter Constitution of India. Prentice-Hall of India. ISBN 9780876922002. Das, Hari Hara (2002). Political System of India. Anmol Publications. ISBN 8174886907. Dash, Shreeram Chandra (1968). The Constitution of India; a Comparative Study. Chaitanya Pub. House. Ghosh, Pratap Kumar (1966). The Constitution of India: How it Has Been Framed. World Press. Jayapalan, N. (1998). Constitutional History of India. Atlantic Publishers & Distributors. ISBN 8171567614. Khanna, Hans Raj (1981). Making of India's Constitution. Eastern Book Co. ISBN 9788170121084. Pylee, M.V. (1997). India's Constitution. S. Chand & Co.. ISBN 812190403X. Pylee, M.V. (2004). Constitutional Government in India. S. Chand & Co.. ISBN 8121922038. Sen, Sarbani (2007). The Constitution of India: Popular Sovereignty and Democratic Transformations. Oxford University Press. ISBN 9780195686494. Sharma, Dinesh; Singh, Jaya; Maganathan, R.; et al. (2002). Indian Constitution at Work. Political Science, Class XI. NCERT. "The Constituent Assembly Debates (Proceedings):(9th December,1946 to 24 January 1950)". The Parliament of India Archive. http://parliamentofindia.nic.in/ls/debates/debates.htm। আহৰণ কৰা হৈছে: 2008-02-22.